Beethoven was deaf when he composed his famous ninth symphony as was Vint Cerf, the father of the internet. There are Deaf swimmers, rappers, radio talk show hosts, go-kart racers and rocket scientists (quite literally) so why not baristas? 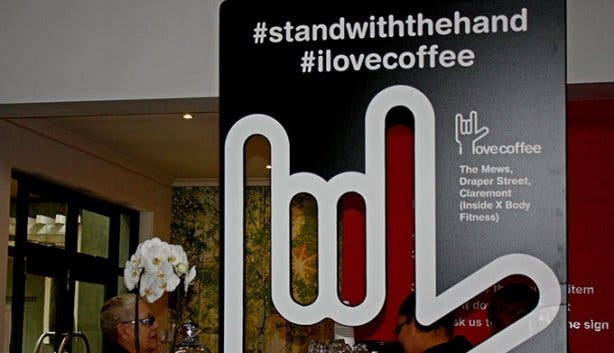 “Why not?” a statement more than a question, that motivated those behind the boundary-breaking concept of i love coffee. 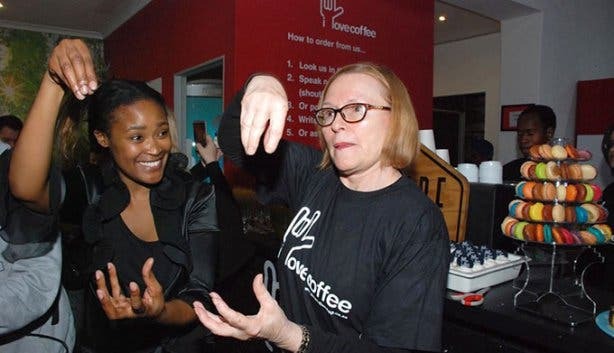 With the help of Tribe Coffee Roasting, friends and an appearance by current Western Cape Premier Helen Zille on the 7 June 2016, i love coffee opened its doors as the country’s first-ever Deaf and Hard of Hearing staffed coffee shop. 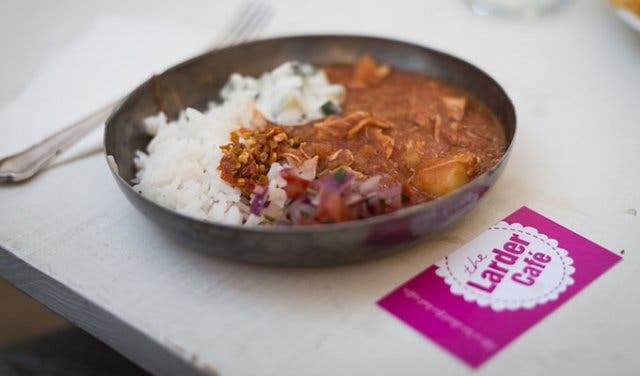 Located in the intimate X-Body Fitness Gym in Claremont this modest café is very much their proof of concept store. 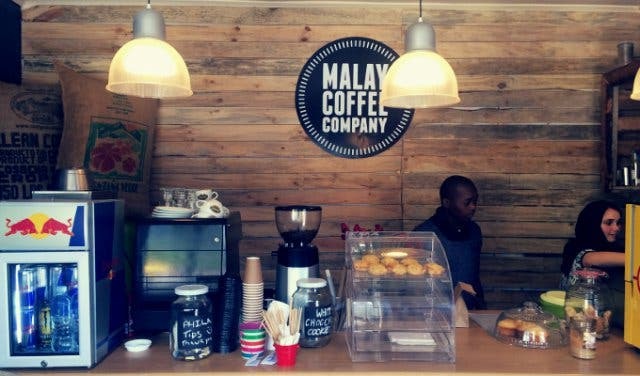 Best for a take-away coffee and pastry, i love coffee is a pop-up with enough seating for 12 to 16 people. It may be small but it is home to some exquisite Tribe coffees. If you enjoy your classics (Americano, cappuccino, latte etc.) then i love coffee has you covered. Upon arrival and in dire need of my Monday morning coffee, I threw myself head-first into i love coffee’s mission. That being to bring two previously separate cultures together over a glorious cuppa. Of course, I was an absolute rookie and this is a heads-up to you, check the wall for helpful tips before you order. With a little coaxing from the baristas, I was taught to order a cappuccino. Imagine one hand as the cup and the other gesturing a soft-serve swirl. Simple, pretty and so much fun to learn. 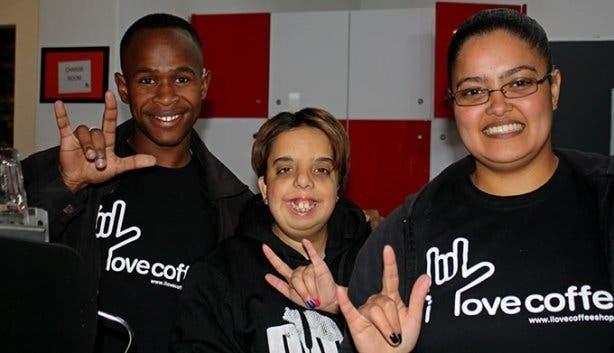 According to the latest census, 4.5% of the South African population is deaf and of that 70% are currently unemployed. Limited education facilities are a big factor but another, according to i love coffee founder, Gary Hopkins, comes down to simple ignorance. 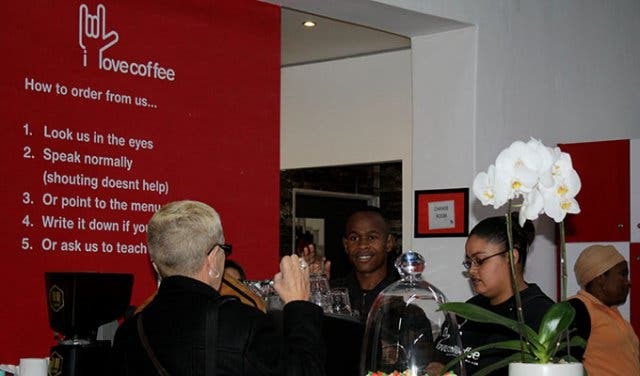 The current three baristas, Kaye-Lynne Goddard, Shanlee Arendse and Thembelihle Quzu were hand-picked from 60 candidates and are truly brilliant at what they do. 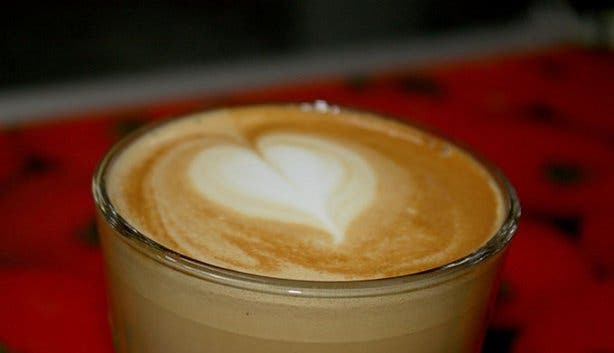 Quick to pick up on visual clues, the three baristas, who are also qualified chefs, can tell perfect froth apart from the mediocre sort just by looking at it. While sipping at my delicious cappuccino, chatting to Kaye-Lynne and a patron who comes in specifically to practice her sign language, I learnt the sign for “Rock Star”. I would describe it as having your fingers crossed much like the way you do for luck and then releasing into a downward burst of the hand. I’m doing the sign little justice but I felt compelled to share and well, you’ll know it when you see it! 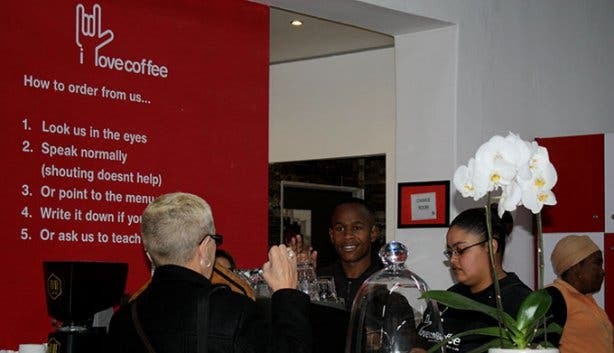 It will take another visit for me to learn to use it in a sentence but for now I’d suggest you be a Rock Star and head over to i love coffee – it’s an experience you need to have. 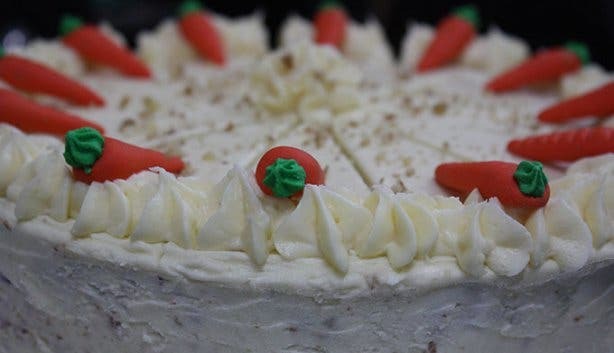 Note: I love coffee do not yet have a full on-sight kitchen but you will find assorted cakes and pastries of the day sourced directly from businesses in the deaf community. A full menu of breakfast, lunch, coffees and cakes is said to be launched in the last week of June 2016. Sister stores are also in the pipeline! 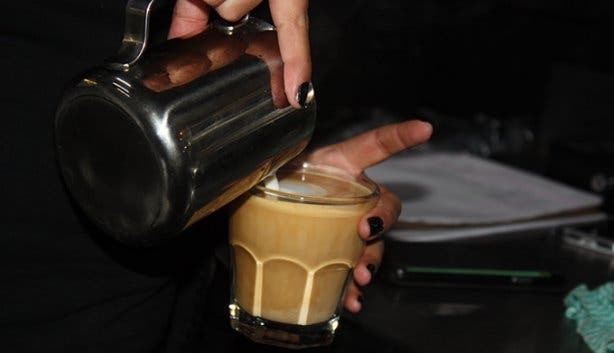 Tip: Decide on the coffee you want, look up, look the barista in his or her eye and order. And relax, the only nervous one is you. 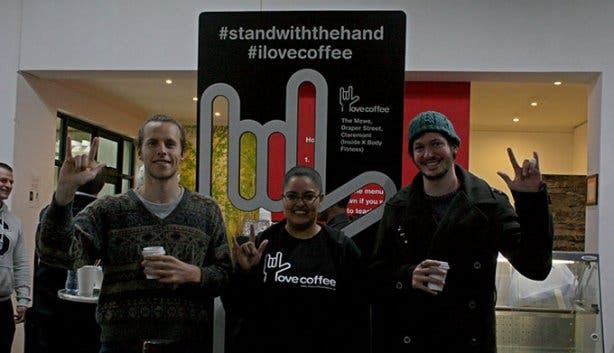 Also, check out new coffee and snack bar From Cape Town With Love on Long Street.